Not to be confused with Palate or Palette (disambiguation). For other uses, see Pallet (disambiguation). 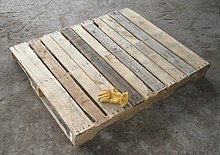 The classic wooden pallet, with a glove for scale. A plastic skid with nine legs, which can be lifted from all four sides. This type of transport is commonly called a pallet, but since it has no bottom it is technically a skid. 48 in × 40 in (122 cm × 102 cm) galvanized steel pallet. Galvanized steel pallets are fireproof and rust resistant. A pallet /ˈpælɪt/ is a flat transport structure, which supports goods in a stable fashion while being lifted by a forklift, a pallet jack, a front loader, a jacking device, or an erect crane; sometimes, a pallet is inaccurately called a skid (which has no bottom deck boards). A pallet is the structural foundation of a unit load which allows handling and storage efficiencies. Goods or shipping containers are often placed on a pallet secured with strapping, stretch wrap or shrink wrap and shipped. Since its invention in the twentieth century, its use has dramatically supplanted older forms of crating like the wooden box and the wooden barrel, as it works well with modern packaging like corrugated boxes and intermodal containers commonly used for bulk shipping. While most pallets are wooden, pallets can also be made of plastic, metal, paper, and recycled materials. Each material has advantages and disadvantages. Containerization for transport has spurred the use of pallets because shipping containers have the smooth, level surfaces needed for easy pallet movement. Many pallets can handle a load of 1,000 kg (2,205 lb). Today, about half a billion pallets are made each year and about two billion pallets are in use across the United States alone. Pallets make it easier to move heavy stacks. Loads with pallets under them can be hauled by forklift trucks of different sizes, or even by hand-pumped and hand-drawn pallet jacks. Movement is easy on a wide, strong, flat floor: concrete is excellent. The greatest investment needed for economical pallet use is in the construction of commercial or industrial buildings. Passage through doors and buildings must be possible. To help this issue, some later pallet standards (the europallet and the U.S. Military 35 in × 45.5 in or 889 mm × 1,156 mm) are designed to pass through standard doorways. Organizations using standard pallets for loading and unloading can have much lower costs for handling and storage, with faster material movement than businesses that do not. The exceptions are establishments that move small items such as jewelry or large items such as cars. But even they can be improved. For instance, the distributors of costume jewelry normally use pallets in their warehouses and car manufacturers use pallets to move components and spare parts. The lack of a single international standard for pallets causes substantial continuing expense in international trade. A single standard is difficult because of the wide variety of needs a standard pallet would have to satisfy: passing doorways, fitting in standard containers, and bringing low labor costs. For example, organizations already handling large pallets often see no reason to pay the higher handling cost of using smaller pallets that can fit through doors. Heavy duty pallets are a form of reusable packaging and are designed to be used multiple times. Light weight pallets are designed for a single use. In the UK, government legislation relating to the Waste Framework Directive requires the reuse of packaging items above recycling and disposal. Wooden pallets typically consist of three or four stringers that support several deckboards, on top of which goods are placed. In a pallet measurement, the first number is the stringer length and the second is the deckboard length. Square or nearly square pallets help a load resist tipping. Two-way pallets are designed to be lifted by the deckboards. The standard 48x40 North American pallet, or GMA pallet, has stringers of 48 inches and deckboards of 40 inches, and was standardized by the Grocery Manufacturers Association. A standard wooden pallet (48 in × 40 in × 6 in or 122 cm × 102 cm × 15 cm) with a static load bearing capacity of 3 short tons (2.7 long tons; 2.7 t) and a 1-short-ton (0.89-long-ton; 0.91 t) dynamic capacity, will weigh approximately 33 to 48 lb (15 to 22 kg) Lightweight plastic pallets can weigh as little as 3 to 15 pounds (1.4 to 6.8 kg), while heavier models may weight up to 30 pounds (14 kg). Standard GMA pallets can hold up to 460 pounds (210 kg). GMA pallets typically weighs 37 pounds (17 kg), and are 6 1⁄2 inches (170 mm) tall. Their deck boards measure 3 1⁄4 inches (83 mm) wide and are 5⁄16 inch (7.9 mm) thick each. Other dimensions of pallets have different weight capacities. Heavy duty IPPC two-way entry wooden pallets from Germany (DE) are approximately 44 inches (1,118 mm) wide by 48 inches (1,219 mm) long, have three wood stringers that are a nominal 4 inches (102 mm) high by 3 inches (76 mm) wide timber, and weigh about 80 pounds (36 kg). Their deck is fully covered by 30 mm (1.18 in) plywood, and has a heavy metal "Z" clip at the middle edge of each side. Four-way pallets, or pallets for heavy loads (or general-purpose systems that might have heavy loads) are best lifted by their more rigid stringers. These pallets are usually heavier, bigger and more durable than two-way pallets. Pallet users want pallets to easily pass through buildings, to stack and fit in racks, to be accessible to forklifts and pallet jacks and to function in automated warehouses. To avoid shipping air, pallets should also pack tightly inside intermodal containers and vans. No universally accepted standards for pallet dimensions exist. Companies and organizations utilize hundreds of different pallet sizes around the globe. While no single dimensional standard governs pallet production, a few different sizes are widely used. 1000 × 1200 39.37 × 47.24 3.1% Europe, Asia; similar to 40" × 48". Of the top pallets used in North America, the most commonly used by far is the Grocery Manufacturers Association (GMA) pallet, which accounts for 30% of all new wood pallets produced in the United States. The ISO also recognizes the GMA pallet footprint as one of its six standard sizes. 31.50 in × 47.24 in × 5.71 in ISO1, same size as EUR. The pallet weight is 20 – 25 kg. Weight of a load: 2490 kg. 47.24 in × 39.37 in × 5.67 in ISO2. The pallet weight is 33 kg. Weight of a load: 1470 kg. 39.37 in × 47.24 in × 5.67 in The pallet weight is 29 kg. Weight of a load of 1920 kg. 31.50 in × 23.62 in × 5.67 in ISO0, half the size of EUR. The pallet weight is 9.5 kg. Weight of the safe load: 500 kg. The Australian standard pallet is a pallet size commonly found in Australia but found rarely elsewhere. It is a square pallet originally made of hardwood 1,165 mm × 1,165 mm (45.87 in × 45.87 in) in size which fits perfectly in the RACE container of the Australian Railway. They are ill-suited for the standard 20 feet (6.1 m) and 40 feet (12 m) ISO shipping containers used around the globe. Australian standard pallets are usually manufactured in hardwood, but 1165 × 1165 mm pallets can also be manufactured using lighter timber suitable for use as disposable pallets using 16 millimetre boards. Extensively used in storage and warehousing, they are popular pallets for racking, with the right shape and size to be removed from transport and directly onto warehouse racking for storage. The Australian Standard Pallet dates back to World War II, while ISO containers date to the late 1950s. Although the pallet's dimensions pre-date the ISO containers, it requires less dunnage, is square, and leaves less wasted space than other pallets, including the GMA pallet. 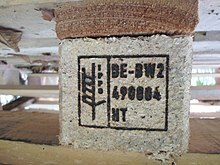 In 2010, Australia adopted the globally accepted ISPM 15 wood packaging material regulations (before this time it was hardwood and more expensive). A number of different organizations and associations around the world work towards establishing and promulgating standards for pallets. Some strive to develop universal standards for pallet dimensions, types of material used in construction, performance standards, and testing procedures. Other organizations choose to focus on pallet standards for a specific industry (such as groceries) or type of material (such as wood). ISO TC 51 states its scope of work entailing the "standardization of pallets in general use in the form of platforms or trays on which goods may be packed to form unit loads for handling by mechanical devices". The Technical Committee works in conjunction with other Technical Committees focused on transportation infrastructure to develop interrelated standards. TC 51 is responsible for developing ISO Standard 6780: Flat pallets for intercontinental materials handling—Principal dimensions and tolerances as well as sixteen other standards related to pallet construction and testing. The National Wood Pallet and Container Association (NWPCA) is a trade organization based in the United States representing the interests of wood pallet and container manufacturers. This organization maintains MIL-STD-1660, the standard description of palletized unit loads for the U.S. Military and some allies. DOD Unit loads generally use 40 in × 48 in (1,016 mm × 1,219 mm) pallets, are less than 4,000 lb (1,814 kg), weatherproof, and stack 16 ft (4.88 m) high. They often use steel pallets, steel straps with notched seals, outdoor plywood, and plastic film. The standard describes tests for stacking, transport, sling, forklift and pallet jack, impact, drop tests, tip, water-retention, and disassembly. Chemical fumigation The wood must be fumigated with methyl bromide. Pallets treated via this method bear the initials MB near the IPPC logo. 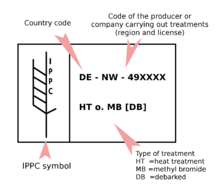 From 19 March 2010 the use of methyl bromide as a treatment according to ISPM15 has now been banned within all EU member states. This is due to causing potential harm to the Earth's stratospheric ozone layer. Although pallets come in all manner of sizes and configurations, all pallets fall into two very broad categories: "stringer" pallets and "block" pallets. Various software packages exist to assist the pallet maker in designing an appropriate pallet for a specific load, and to evaluate wood options to reduce costs. Stringer pallets are one of the original models of wooden pallets. They use a frame of three or more parallel pieces of timber (called stringers). The top deckboards are then affixed to the stringers to create the pallet structure. Stringer pallets can have a notch cut into them allowing "four-way" entry. Forklifts can lift a stringer pallet from all four directions, though lifting by the stringers is more secure. Stringer pallets no longer need to be built in or permanently attached to the pallet making it possible customize the basic pallet. Stringer pallets can be made of both wood and plastic. Block pallets are typically stronger than stringer pallets. Block pallets utilize both parallel and perpendicular stringers to better facilitate efficient handling. A block pallet is also known as a "four-way" pallet, since a pallet-jack may be used from any side to move it. All stringer and some block pallets have "unidirectional bases," i.e. bottom boards oriented in one direction. 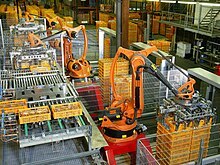 While automated handling equipment can be designed for this, often it can operate faster and more effectively if the bottom edges of a pallet have bottom boards oriented in both directions. For example, it may not need to turn a pallet to rack it, and operation is less sensitive to pallet orientation. The least expensive way to improve a pallet is usually to specify better nails. With non-wood pallets, a controlled coefficient of friction is often helpful to prevent the pallet from slipping from forks and racks. Stiffer pallets are more durable, and are handled more easily by automated equipment. If a pallet does not need to be lifted from all four sides, two-way pallets with unnotched stringers may be used, with the additional benefits of added rigidity and strength. Specifying tolerances on flatness and water content may help the supplier meet target requirements. Inspection of pallets, whether in person or by a third-party (such as "SPEQ" inspected pallets) offer additional assurance of quality. The production of pallets accounts for 43% of hardwood and 15% of softwood usage in the U.S. The cheapest pallets are made of softwood and are often considered expendable, to be discarded as trash along with other wrapping elements, at the end of the trip. These pallets are simple stringer pallets, and liftable from two sides. Slightly more complex hardwood block pallets, plastic pallets and metal pallets can be lifted from all four sides. These costlier pallets usually require a deposit and are returned to the sender or resold as used. Many "four way" pallets are color-coded according to the loads they can bear, and other attributes. Wood pallets can pose serious bio-hazard risks as they are susceptible to bacterial and chemical contamination, such as E. coli problems in food and produce transportation, and even insect infestation, and thus the need for ISPM 15. Paper pallets, also referred to as "ecopallets", are often used for light loads, but engineered paper pallets are increasingly used for loads that compare with wood. Paper pallets are also used where recycling and easy disposal is important. New designs of ecopallets have been made from just two flat pieces of corrugated board (no glue/staples) and weigh just 4.5 kg (9.9 lb), offering dramatic freight savings. Ecopallets are also ISPM 15 exempt, negating fumigation and barrier "slip" sheets. They are cleaner, safer, and provide a cost-saving eco-friendly alternative to other pallet materials. Some engineered Corrugated pallets offer a significant reduced height, providing substantial freight cost reduction. Low profile hand pallet trucks allow picking up pallets as low as 25 mm. Steel pallets are strong and are used for heavy loads, high-stacking loads, long term dry storage, and loads moved by abusive logistic systems. They are often used for military ammunition. Metal pallets make up less than 1% of the market. Materials include carbon steel, stainless steel, and aluminum. Of these, carbon steel offers excellent durability at the lowest cost. Stainless steel doesn’t require a paint coating, and is preferred for such applications as clean room environments. Carbon steel units are expensive compared to wood, and stainless and aluminum cost about 2–3 times that of carbon steel. Long term costs, however, can be lower than wood. General advantages of metal pallets are high strength and stiffness, excellent durability, bug free, no splinters, sanitary, and recyclable. Disadvantages include a higher initial price, significant weight, low friction, and susceptibility to rusting (carbon steel). Metal is primarily used in captive or closed loop environments where durability and product protection are key performance requirements. Metal units today are increasingly price competitive and lighter in weight. Primary industries that use metal pallets include automotive, pharmaceutical, lawn tractors, motorcycles, and tires. Aluminum pallets are stronger than wood or plastic, lighter than steel, and resist weather, rotting, plastic creep and corrosion. They are sometimes used for air-freight, long-term outdoor or at-sea storage, or military transport. Plastic pallets are often made of new HDPE or recycled PET (drink bottles). They are usually extremely durable, lasting for a hundred trips or more, and resist weathering, rot, chemicals and corrosion. The benefits of plastic pallets over wood pallets include the ability to be easily sanitized, resistance to odor, fire retardancy, longer service life span, durability and better product protection, non-splintering, and lighter weight, thus saving on transportation and labor costs and making them safer and more environmentally friendly.They often stack. Plastic pallets are exempt by inspection for biosafety concerns, and easily sanitize for international shipping. HDPE is impervious to most acids and toxic chemicals clean from them more easily. Some plastic pallets can collapse from plastic creep if used to store heavy loads for long periods. Plastic pallets cannot easily be repaired, and can be ten times as expensive as hardwood, so they are often used by logistics service providers who can profit from their durability and stackability. The large supply chains have increased the use of plastic pallets as many organisations seek to reduce costs through waste, transport and health & safety. Pallets and dollies can be combined (for example the Pally) ,eliminating pallet instability and the need for additional lifting equipment along with creating valuable space in busy operating environments. They also deliver significant time and cost savings by reducing supply chain handling. Plastics' reusability has contributed to an increase in usage of plastic pallets. Plastic pallets are produced and used widely in the U.S. and Europe, spurred by the adoption of the ISPM 15. A full comparison of wood vs plastic can be made by a life cycle analysis. Plastic pallets can cost 10 times as much as hardwood pallets and even more expensive compared to cheap expendable softwood pallets. RFID chips can be molded into the pallets to monitor locations and track inventory. Skids date back to Ancient Egypt and Ancient Mesopotamia, at least as far back as the 1st millennium B.C. The development of the forklift and the needs of World War II logistics operations led to substantial use of pallets. References to the early modern pallets types are slim with a string of patents showing parts of the development. The earliest may be a U.S. patent on a skid from 1924 describing Howard T. Hallowell's "Lift Truck Platform". In the late 1930s, pallets became more commonplace with the newer forklift types. 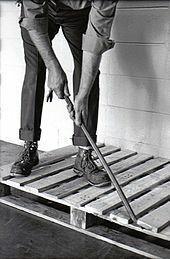 George Raymond filed for a patent in 1938 (granted US Patent 2178646 in 1939 ) for a pallet designed to complement a new pallet jack design; the essential features of both are still in common use today. A 1939 patent from Carl Clark shows type of pallet with steel stringers. War time developments were often just patented after the war, so there is a patent from Robert Braun on a four-way pallet in 1945, and a patent from Norman Cahners (a U.S. Navy Supply Officer) shows a disposable pallet type in 1949. The complete construction principle of a modern four-way pallet is described by Darling Graeme in 1949. Old and discarded wooden pallets can be used in pallet crafts and various furniture pieces. Discarded wooden pallets should not be used for firewood or crafts unless it has been determined that the wood in these pallets has not been treated with wood preservatives, fungicides and/or pesticides. Various pyrethrins and propiconazole are common treatments for wooden pallets. In addition, imported palletized goods are routinely fumigated with highly toxic pesticides. During use, harmful materials or chemicals also may spill on the pallet wood and be absorbed. Craft publications have advised readers to use pallets to build a skateboarding obstacle called a manual pad, barricades during amateur paintball games, or other sport-related items. Other publications have suggested using pallet wood for small animal cages or fences. Pallet wood has been recycled for use as furniture wood by at least one company. The acoustic guitar maker Taylor Guitars once produced a high quality "pallet guitar" made from pallet wood, in order to demonstrate the importance of construction technique versus expensive exotic woods. I-Beam Design, an architecture and interior design firm based in New York, NY won an award in a 1999 competition sponsored by Architecture for Humanity for their submission of “The Pallet House”, a design solution to house the returning refugees of Kosovo. Full-scale prototypes of The Pallet House were featured in the "Casa per Tutti" Exhibit at the Milan Triennale and the Earth Awards in HRH Prince Charles’ Royal Gardens as part of The Prince’s Charities Foundation’s Conference on a Sustainable Future organized in collaboration with IBM and The Financial Times. The Pallet House is an affordable transitional home that can become permanent over time. It can be used as refugee housing or as affordable housing as well. Due to the nature of the Pallet module, the wall cavity can be insulated with a variety of materials that are accessible to the user. The two Austrian students Andreas Claus Schnetzer and Gregor Pils from the University of Vienna created a home entitled Pallet house and as the name suggests, reused pallets to form a modular, energy efficient and affordable housing. 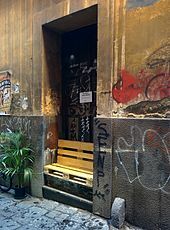 The idea was born in 2008 during a competition and the Pallet house has been exhibited in several European cities including Venice, Vienna, Linz and Grenoble. It could become a clever approach to low income housing. Denver, Colorado was host to an Inaugural Pallet-Fest festival that showcased the versatility of pallets and included large art structures made with upcycled materials, a pallet maze, a pallet amphitheater with live musical performances, sustainable living demonstrations, an upcycled fashion show, vendors and artists selling upcycled goods, and a parkour course. The event was crowdfunded and organized by Upcycle Events. Items made from pallet wood are likely to be durable and demonstrate good weather resistance due to these treatments. However, close contact with pallet wood or inhalation of dusts from sanding or sawing can be a source of exposure to pesticide and fungicide chemicals. It is likely that the January, 2010 recall of Johnson and Johnson Tylenol and other drugs was due to their being stored on wooden pallets that had been treated with the fungicide/pesticide 2,4,6-tribromophenol. This chemical can be degraded by molds to produce 2,4,6-tribromoanisole whose strong, musty odor caused consumers to complain. There is no acute or chronic health data on 2,4,6-tribromoanisole, but it is believed that the contaminated drugs caused nausea and other health effects in some people. Both wood and plastic pallets are possible fire hazards. The National Fire Protection Association requires that both types "shall be stored outside or in a detached structure" unless protected by fire sprinklers. Wood pallets used to transport food can possibly harbor pathogens such as E. coli and Listeria. A release by the National Consumers League announced the testing of 70 wood pallets and 70 plastic pallets that have been loaded with perishable products and shipped to an end user was shipped overnight to an independent microbiology lab for testing. The results came back with 10 percent of the wood pallets (7 pallets) positive for E. coli and 1.4 percent (1 pallet) positive on the plastic pallets. Pallet boxes are pallets with four pallet walls on top and possibly a lid. Unlike pallets, pallet boxes can be stacked when they are fully loaded. They may also be fitted with a lid during stacking for stability reasons. By stacking pallet boxes on each other space can be used more efficiently, thus are able to save warehouse space and truck load capacity. Another advantage of pallet boxes is that the goods are stored safely and are not easily damaged during logistic movements and transport. Furthermore, there are collapsible pallet boxes from which the pallet walls can be laid flat on the pallet. In this way, less space is required during empty return transport. ^ a b c "Three minutes to learn about pallets". ^ "All the pallet terminology you'll ever need to know". Retrieved Nov 3, 2017. ^ "What is a GMA pallet?". Retrieved Nov 3, 2017. ^ "Standard Pallet Dimensions". Retrieved Nov 3, 2017. ^ "Pallet Types". Retrieved Nov 3, 2017. ^ "Standard Pallets Sizes & Dimensions". Retrieved Nov 3, 2017. ^ Raballand, Gaël; Aldaz-Carroll, Enrique (February 2005). How Do Differing Standards Increase Trade Costs? The Case of Pallets (Report). World Bank Policy Research Working Paper No. 3519. doi:10.2139/ssrn.665064. SSRN 665064. ^ "What Are The Standard Pallet Size Dimensions?". Retrieved Nov 3, 2017. ^ "ISO 6780:2003 - Flat pallets for intercontinental materials handling -- Principal dimensions and tolerances". International Organization for Standardization. Retrieved 2019-01-31. ^ Clarke, John (2004). "Pallets 101: Industry Overview and Wood, Plastic, Paper, and Metal Options" (PDF). Archived from the original (PDF) on 2009-11-22. Retrieved 2019-01-31. ^ "18-2010 - Adoption of bark tolerance for imports defined in the wood packaging standard ISPM 15". Commonwealth of Australia. Archived from the original on 2010-06-27. Retrieved 2010-06-25. ^ "ISO/TC 51 – Pallets for unit load method of materials handling". International Organization for Standardization. Retrieved 2019-01-31. ^ "National Wood Pallet and Container Association Mission". Archived from the original on 7 May 2004. Retrieved 1 September 2016. ^ "Home". Retrieved 1 September 2016. ^ "ISPM 15 WPM Clarification - Timber Creek". Retrieved 1 September 2016. ^ "Palletology". Alliance Pallets of Chicago. Retrieved 31 August 2017. ^ "U.S. Pallet Market Statistics | Reusable Packaging News". ^ "Don't reuse wood pallets". Cheap Like Me Blog. 3 June 2010. Retrieved 8 February 2015. ^ "HSM MAGAZINE - Home". Retrieved 1 September 2016. ^ Grande, Joseph A. (September 2008). "Plastic Pallets Gain Ground In an Eco-Conscious World". Plastics Technology. Retrieved 8 June 2014. ^ Yam, K. L. (2009). Encyclopedia of Packaging Technology. John Wiley & Sons. ISBN 978-0-470-08704-6. ^ "Remains of timber, the lengths laid upon the pavement parallel to one another (fig. 114) where a large number of blocks were found, suggest skids upon which they were moved". (Loud, 1936: 108). Cited by Peter Roger Stuart Moorey, Ancient Mesopotamian Materials and Industries: The Archeological Evidence (Eisenbrauns, 1999), page 32. ^ Vanderbilt, Tom (14 August 2012). "Pallets: The single most important object in the global economy". Slate. Retrieved 16 August 2012. ^ "US Patent 2178646 A". Retrieved 20 January 2015. ^ Singh, R. R. (2013-07-18). "Pallets – An efficient and safe way of material handling" (PDF). Bureau of Indian Standards. Archived from the original (PDF) on 2014-02-02. Retrieved 2014-01-22. ^ Ion, Alex (February 2012). "Ultimate Pallet Furniture Collection: 58 Unique Ideas". Decoist. Retrieved 19 May 2014. ^ "Pallet Guitar". Archived from the original on November 20, 2008. ^ "Pallet House / Schnetzer Andreas Claus + Pils Gregor". 7 April 2010. Retrieved 1 September 2016. 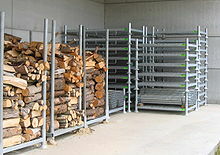 Wikimedia Commons has media related to Pallets.